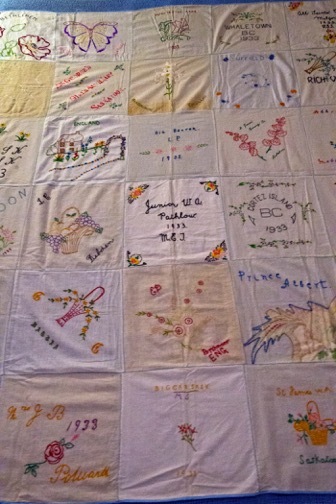 An embroidered quilt top/bedspread (unfinished) was discovered among various treasures stored away in at the home of Jean Bennett as she was preparing to “downsize” and move into a seniors’ residence in Melfort, SK in January 2015. Jean does not recall how she came into possession of the quilt top/bedspread, unless perhaps her older sister, Mary (Trent) Swaffield passed it along to her, as it is thought Mary’s initials are on the square depicting the “Junior W.A. Pathlow 1933”. Unfortunately, Mary is now deceased. Contact was made with the Saskatoon Diocesan Archivist and the Saskatoon Diocesan ACW for possible information, but it will take some time to research any records. Meanwhile, it is hoped that someone reading this article might have some recollection of either having participated in this project or heard about it through family members or, perhaps, it was mentioned in ACW minutes that are in storage. The quilt top/bedspread does not have a backing on it, but has been bound along the outer edges with light blue seam binding. There are 30 squares in the approximate size of 10 1/2” x 11”, all beautifully hand embroidered in mostly floral designs and one square has a large outline of a butterfly. Some of the fabric seems to be linen, but most is white or off-white cotton and perhaps cut from flour sacking. There are a few squares in light beige cotton. Some squares depict the year 1933 and one square indicates April 1933. Also embroidered on the squares are names of various ACW branches, Anglican parishes, a Girl’s Auxiliary, a Sunday School, and also initials of probably the people who embroidered the squares, and most depict place names throughout the Anglican Dioceses of Saskatchewan and Saskatoon and, possibly Qu’Appelle, as well as names from England, and British Columbia. Names that might help in identifying this special project are as follows: Bethlehem; Buckle, Eng. ; Whitefish Lake, 1933; Cortez Island, BC, 1933; Whaletown, BC, 1933 (Note: Whaletown, BC is located on Cortez Island, BC); All Saints Church, Melfort, 1933 & initials D.I.T. ; St. George’s Girl’s Auxiliary, Saskatoon; Bradninch, Eng. ; Duffield, & initials: K. J. M.; Rich Valley, W.A., Sask. ; Leask, Sask. 1933; Big Beaver & initials: L.P. 1933; St. James Evening Branch, Saskatoon; All Saints Mothers’ Union; St. James Saskatoon, 1933; Debden & initials: L.C. ; Junior W.A. Pathlow, 1933, initials: M.E.T. ; All Saints, S. School; Shell River, Sask, April 1933; Maggies; Birchmoor, Eng. & initials: E.D. ; Prince Albert; Canwood, 1933; Mrs. J.B., Polwarth, 1933 (note: Polwarth seems to be a place name NW of Canwood, SK); Biggar, Sask. & initials: M.S. ; St. James W.A., Saskatoon; Shellbrook, 1933. Each square is machine sewn together and outlined in light blue embroidery stitching. Please share this article and photo within your parishes, your family and friends to see if there are any memories about this project. If you have information, please contact Saskatoon Diocesan ACW President: Elta Fae Marlor by e-mail: efmarlor@gmail.com, or Peter Coolen, Archivist for Diocese of Saskatoon, ptrcoolen@sasktel.net.